MANGANESE GREENSAND - iron, manganese and hydrogen sulphide removal. VALVES - epoxy coated cast iron hydraulic diaphragm valves as standard. Plastic valves are available if required. CONTROL OPTIONS - 7 day timer, manual controls or water meter initiated are also available. MULTIPLE OPTIONS - all models are available as Multiple systems ie. multiple filters with common manifold allowing for uninterrupted, continuous filtered supply. 4550 WATER TEMP 5° - 50°C water ph 5.5 - 9.0 suspended solids max 100 mg / l iron no effect oil free of hydrocarbons Note: not recommended for Colloidal Sediment removal. 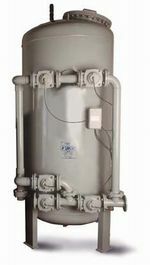 3000 WATER TEMP 5° - 50°C water ph 5.5 - 9.0 suspended solids max 10 mg / l iron will effect service life oil free of hydrocarbons Note: flow rate will depend on application - consult IBC Water. 3600 Alkalinity should be greater than two times the combined sulfate and chloride concentration. Note: due to the complexities of iron, manganese and hydrogen sulphide it is recommended that product selection be referred to IBC Water.